Could you use Splenda brown sugar and would that drop the points? Great recipe! A sweet treat I made for visiting relatives. We made muffins because it is easier for portion control. Thank you! Delicious! My kids ate zucchini! This was my first attempt at a bread and it turned out really great. I made this last night and it was amazing!! This was my first time ever baking anything from scratch and it was a really easy recipe! I added some cocoa powder that I had on hand, although I forgot that I should switch it out with some of the flour has others suggested (in the end it apparently had no bad effect on the bread, although it gave a very nice cocoa flavor). I also made it with dark chocolate chips as my boyfriend and I like dark chocolate better, and it turned out really yummy! I had to make it in muffin tins because it turns out the loaf pan I thought I had was really a mini loaf pan – oops! Still, the muffins turned out great. I ended up doing about 35-40 minutes total in the oven, mostly because I kept opening it every 5 minutes after 20 minutes to check, and also my oven is very old and definitely due for a replacement very soon! Anyway, thank you so much for this recipe, we’re eating the muffins for breakfast this week (along with an egg and fruit, perfect breakfast!). This recipe is making me want to try out more healthy baking recipes! Did you squeeze the water out of the zucchini? Or leave it for moisture? I made these a few days ago and they were great! So flavorful and moist. I just pulled another batch out of the oven too. One mishap this time – the butter blew up in my face when I was heating it in the microwave! Be careful y’all! Thanks for the recipe. Can you use almond flour instead of AP/WW? Not sure if this was suggested already as there are heaps of comments. But you can add more chocolate flavour as well by switching a bit of the flour for cocoa powder! Did just a 1/4 cup myself an it was delightful. Have to say this is one of my facvurite breakfasts. With fruit and coffee. Made it two days ago and this time added a couple oft tbsp of cocoa into the batter I loved it that way! This is delicious!!! GREAT recipe!! Gina, I made this over the weekend and it turned out perfectly. I used stone ground wheat flour because I was too cheap to buy a full bag of white whole wheat flour for just this recipe and the muffins turned out great. I want to add walnuts to the recipe to see how it turns out next time. I have tried 4 of your recipes and all remain on my list. I mistakenly did not adjust for cooking time and left my muffins in the oven for 45 minutes, but the result was not bad at all. They were dark, but they were not dry or burned. I look forward to trying this recipe with walnuts and a shorter cooking time. Amazing! I had everything in my pantry which is why this recipe is a definite go-to for me. Used unsweetened applesauce and I used 1 fat zucchini to yield the 1-1/2 cups needed. Baked them in a muffin tin (took 25min), they made some really nice sized muffins, they freeze wonderfully. Will be making these again for sure! I just have a question about the serving size. It states 16 slices. Is this for only one loaf? I know your chocolate zucchini bread is 16 slices but for 2 loaves. Thank you. Could I substitute summer squash for the zucchini? Also – love your site. SO many of our go-to recipes are SkinnyTaste. Love your book, too – great options! 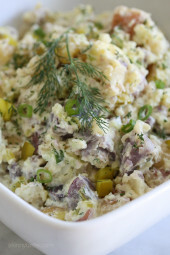 I made this last weekend with summer squash, I thought it was great! 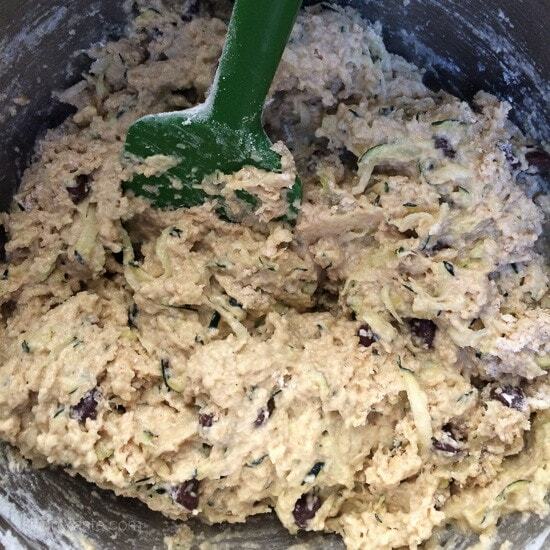 Recently King Arthur flour posted some zucchini recipes with the zucchini pureed. With this technique you can't detect that there's zucchini in the recipes. Given that you're not squeezing the zucchini dry in this recipe, I think the same technique could work – also makes the recipe super quick because everything is done in the food processor. I'll try it out and let you know. Um, this is crazy how timely this is. I was literally just thinking I needed to find a good recipe for zucchini bread to sneak some veggies into my kids' diets. Thank you Gina! Looks delicious! 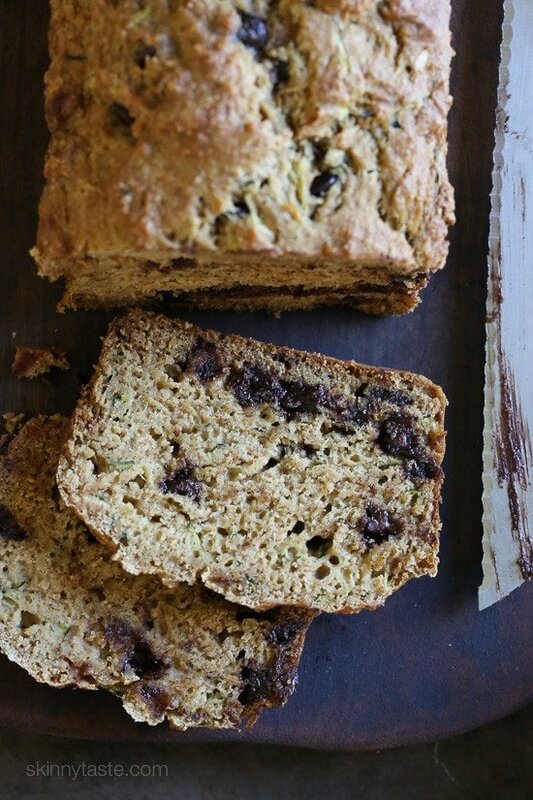 I love zucchini bread as it's always so moist so this looks fabulous! The sugar content is high on this (15 grams). Any way to lower that by subbing out some of the sugar? This sounds delicious! I pinned it to make later. Would whole wheat pastry flour work ok for this? I made this last night! I did make a couple changes and doubled the recipe. I used 3 c of white whole wheat flour, 1 c of vanilla protein powder. Because of this I increased the baking soda from 2 1/4 to 3 tsp. Then, I added 6 tbs of hemp seed and every bit of 3+ cups of zucchini. It is a little heavy but nutritionally packed!! And the additions, did not alter the Points Plus from my calculation. I love this recipe so much that when I have an abundance of zucchini in my garden, I shred it and freeze it in 1 1/2 cup portions…..so in November (like today) I can make a loaf or two so quickly if my kids ask for it! It's soooooo good. Hi Gina! Can you use whole wheat pastry flour in place of whole wheat flour? I'm not sure if there's a huge difference, or if the portion would change. Thanks! Great recipes… this is a must… Also great snack for long distance cycling. I just made this recipe with Cup 4 Cup gluten free flour. So good! I just substituted both flours called for with the cup 4 cup blend. It worked out fine and both of my kids liked it. I added a pinch of cinnamon. Have made 100's of your recipes and been disappointed in none of them. This is another one to add to the keep and do again list! Yummy!!!!! Great recipe to use up my last bag of frozen homegrown shredded zucchini. I added a 1/4 cup walnuts and 1/4 cup raisins. Very yummy indeed. Not sure if this was asked already – but, could I substitute melted butter with coconut oil? I love your site!!! The recipes are all so amazing and the food presentation and photography are absolutely STUNNING!!!!!! Thanks alot!!! Made these today and 2 out of 3 kids approved! In fact, my most picky eater grabbed a spoon to scrape the remainders off the paper wrapper, that's how much he liked it. I used unsweetened applesauce and mini semi-sweet chips. Yum! So, I just made it exactly as stated, and it feels to flour-ey, is that the wheat flour? 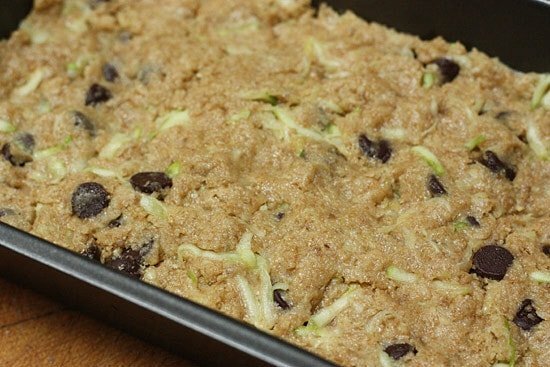 Just curious if I wanted to make these more oatmealy- I think i'm looking for that taste, could I take out 1 cup of wheat flour and put 1 cup of oatmeal in? thoughts? One of my personal favorites from your blog! And my baby and toddler both go crazy for it. My son asks for "kini bread" quite often and just knowing that his favorite treat contains loads of green veggies hidden inside is a wonderful thing to a mama! wow! Just made it and it came out amazing! My husband loves it! Thanks so much for all of your wonderful recipes! I absolutely love this recipe, delicious! Thanks so much! I love this recipe thanks so much, delicious!!! Made this last night and my husband and kids loved it. It tasted so moist and delicious. I ate the last piece this morning with coffee. What a combo! I made these last night as mimi muffins (less messy for my kids to eat), and they turned out great. I added to the recipe some wheat grem and groung flax seed. This recipe will be addad to my weekly muffin rotation. lol Thank you so much for sharing, and I can't wait to try some more of you recipes this week for dinner! I just made these but I did not shred the zucchini enough! They came out…with too many chunks! It was not very good. So, batch #2 is in the oven and this time I pureed the zucchini in the blender first. They smell delicious! Just made these into muffins. 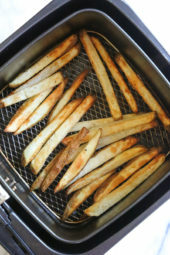 Baked for 35 minutes in a DeMarle flexipan. YUMMY!!!!!! Ok, made this 2 times with a few changes based on what I had on hand in the kitchen. First time I made a single batch with some homemade applesauce. The applesauce was not really that "juicy". I also substituted mini chocolate chips instead of the regular sized ones. It turned out delicious! Then I made a double batch and this time I used 1 can of crushed pineapple instead of the applesauce. I did drain just a bit of the juice off though. I used the mini chips again. This time it came out even better. The crushed pineapple was great in the recipe! Gina, I absolutely love your site and use many of your recipes. They are thoughtfully prepared, beautifully photographed and easy to execute. I actually just made a variation on this recipe with spinach and corn. I will let you know how it turns out. Thanks for you efforts to help the rest of us! Hi Gina, I made this tonight and it had too much moisture. I was really surprised because I make a lot of your recipes and they always come out perfect. I grated the zucchini in my food processor and I'm thinking that maybe that's where I went wrong. For a medium sized zucchini, how much would you say you use? I used all but about 2 inches of 1 medium zucchini and that was loosely 1 and 1/2 cups in my measuring cup. Advice? How did you shred your zucchini? Gina, I was looking to make this today.i had a question about the flour. I saw a lot of questions regarding the flour.i did not see an answer for this one. Can we use whole wheat pastry instead of regular whole wheat. Thank you. Made this bread into cupcakes last night- freaking amazing. My boyfriend said it was the best "snack" he's ever had. I love that there is no oil and hardly any sugar. You never cease to amazing me. Made this bread yesterday and it is fantastic! Super moist and easy to make. My son is a picky eater and he loves it. Thank you! Fantastic recipe! 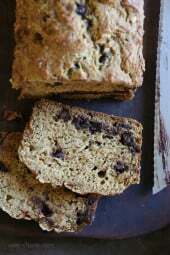 I followed it to a tee and made a fabulous zucchini bread that my husband and two year old loved! I loved that it had no oil, minimal sugar and didn't taste healthy, but was! Thank YOU! How long do you bake the muffins? I'm going to try 25 minutes. I just made this for myself and my daughter (who is 15 months old) — We both love it! Our family is on a budget, so I made a few modifications, based on what we have on hand. I halved the chocolate chips, used canola oil in place of melted better, and used cinnamon applesauce in place of original. Delicious! Thanks, Gina! I made this recipe tonight. I picked up some zucchini from a market over the weekend and couldn't wait to make bread with them. One zucchini made 3 loaves. This recipe is SO good! My husband already had 2 slices! I've tried several of your recipes (eggplant last night!) and they are all now favorites in my home. Thanks for sharing! I replaced the applesauce with canned pumpkin and the chocolate chips with butterscotch chips. To die for!! Even my mother-in-law loved them and she usually doesn't think much of my "skinny" recipes (she's a sugar fiend). I made this tonight in the microwave! I put the mixture in a silicone loaf pan and nuked it for about 11 minutes on high. It's amazingly delicious and I didn't even heat up the house! I love your recipes. I plan to make this with yellow squash because I have them coming out of my ears, I'm picking 3 to 5 a day and my friends run when they see me coming. Just made a loaf and a batch of muffins! They are delicious! Very happy to have found you!!! I added a bit of cinnamon to the previous loaf, and it really didn't "do it" for me so I've left it out this time. This has made a nice addition to our breakfast menu. We heat up a slice for about 30 seconds in the microwave and spread just a touch of Brummel & Brown on it. Served with a nice bowl of fruit and a hard boiled egg, it really starts the day off nicely. You just keep making your way onto my table, Gina! This came out great! Can't believe it's only 2tbs of butter! I made 2 (since zucchini is plentiful right now in my garden) and the one in silicon pan came out fine, but the other one in metal pan got stuck. Next time may use a quick oil spray first. I seriously stopped going to other websites for recipe ideas since I can get so many great ones here.. And most importantly, made the healthy way! Yummy. I made a double batch and for the second half I skipped the chocolate chips and added 1/2 c walnuts, 1 tsp cinnamon and 1/2 c Craisins. Made them into muffins – great treat! So moist and delish!!! Doesn't taste "low fat". Another great recipe!!!!!! Just made this and it is delicious. The sugar is in the directions with the dry ingredients. It says sugar instead of brown sugar, so I had a little confusion too. Other than that, it was perfect. Cooked the full 55 min. I don't peel or seed my zucchinis as I don't think it was necessary. SO yummy. These are so yummy! My husband told me to "not ever lose this recipe!" I made these last night and they were delicious. Sweet but not too sweet and surprisingly moist. I followed the recipe exactly and it turned out perfect. Thanks for the recipe. Excited to try more! Thank you Gina! 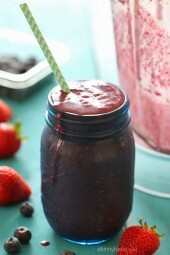 This is a GREAT recipe, and sooo healthy. I made one plain, and added 2T cocoa powder to the other one for a chocolate one. YUMMY! I had a Cooking Light recipe as my standby, and that has been replaced with yours! Thank you!!!! I made this today. It's so delicious!! Made this two nights ago and it is AMAZING!!! Hubby loves it and so do my boys! Yeah a winner!!!! Thank you. How should one measure brown sugar without packing it? I couldn't figure that out either, so I just used 1/3 cup brown packed sugar. This worked fine. I made this today and loved it! My kids can't get enough of it. I followed the recipe as is, and then I decided to add 1 tsp. of cinnamon. I baked it for 45 minutes…perfect! Thank you for sharing this great recipe. I made these today into 12 muffins, and cooked for 22 minutes at 325. They turned out perfectly moist and delicious! Thanks for another wonderful recipe, Gina. I didn't have apple sauce in the house, but had everything else for this. So I searched for regular-fat recipes for this kind of bread. Holy moly. Some of them called for a 1/2 cup of oil in one loaf! Needless to say, I just decided to make the trip out for apple sauce since I know this bread is yummy (made it last July) and why make one with all the extra fat?! Thank you, Gina. My whole family enjoys this bread! I am completely smitten. 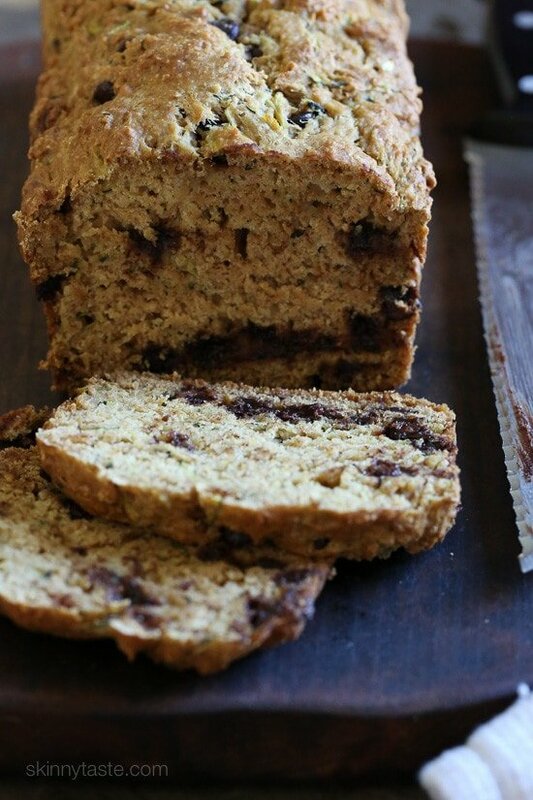 This healthy version is way better than all other zucchini bread I have tasted! All the kiddos (even the picky eater visiting for a play date) loved it. Thank you so much for spending time, and having the talent, to make such lovely food that tastes good and and is good for us too! Your recipes have replaced the Betty Crocker bible in our house. This was fantastic, made a loaf for me and one for my brother's family. My 5 year old was afraid of the "green stuff" at first, but then she had a bite and inhaled the rest! Just made this with the zucchini from my garden. AMAZING. I doubled the recipe and made a loaf of bread and muffins. They all turned out perfect.Super moist, not too sweet, and absolutely delicious. I am very impressed with many of your desserts. So far my favorite is the Strawberry Cheesecake. Yum! I made this w/the help of my boyfriend's daughter. We had 2 loaves. I took some home to my parents and my mom said this is so much better than my zucchini bread. My mom wants me to make it again. Also, the daughter just kept eating it! Needless to say the bread did not last long! Made this a few weeks ago and making it again tonight! So, so yummy! SOOOOOOOOOOOOOOOOOOOOOOOOOOOOOOOOOOOOOOO good. It's going to be really hard not to eat the entire loaf in one sitting. Tried a variation of this with blueberries instead of chocolate chips — yum! Just made this and it is DELICIOUS!! Thank you. Wondering if I could substitute walnuts for the chocolate chips? Might try it next time. Oh My Goodness, I made this tonight and it was oh sooooo good!!!! Awesome recipe!!!! I love this recipe! I have it pinned on my "tried and true recipes" board on Pinterest so I have quick access to it. I omitted the chocolate chips, to lower the calorie count, and added 2 shredded carrots, and made muffins instead of the loaves. Love these for a snack, and so does my 18 month old picky eater! Thanks for always sharing wonderful, healthy recipes! This is definitely a keeper!! I added cinnamon and nutmeg and used butterscotch chips instead of chocolate!! Yumm-O!! I love your site and your recipes and thank you SOOO much for including the nutrition facts and points values, makes my life so much easier!! Did you prep the pan? The bottom of my bread stuck and left a hole in the bread! Other than that, delicious! I made this last night and it turned out WONDERFUL! Thanks for another awesome recipe! I made this recipe as muffins and my boys are gobbling them up! I told them the "green stuff" was a secret magic ingredient which makes the muffins so yummy. Question, I'd like to increase the good-for-you factor by adding ground flaxseed but I don't want the muffins to turn out too dry — how much flaxseed would you suggest adding? I don't thik they would get too dry, maybe 1/4 cup? I just made this recipe and yum yum..Delicious. The only thing I did different was add 1/2 tsp. Cinnamon. Its a keeper! Can I use white chocolate chips instead of regular? My friend is allergic.. So Sorry, hard to keep up with thousands of comments, Yes you can use white or leave them out all together. I made this recipe as muffins the other night, they are amazing! I told the kids they were chocolate chip muffins because I knew they would make a face at the zucchini part. They love them. They are so sweet, and I know they are healthy. Thanks for your site, I will be visiting often for recipes. This was amazing!! So moist – I loved it! I just discovered your blog a couple weeks ago. This is the 3rd recipe I try and they've all been a success. I only recently started to cook and those recipes are really easy to follow! Thanks so much – I'm already spreading the word about your blog to my friends and family! i plan to make these but would like to make with jarred baby food instead of the applesauce and zucchini. i have a apple, zucchini cinammon baby food that my little one loved and this way she wouldnt know it was in there because its pureed. how would you adjust the applesauce/zucchini measurements for that? i was thinking 2c of the puree instead of 1 1/2c zucchini and 1c applesauce? I made this into muffins and my two girls LOVED them!!! Best of all… they had no idea that they ate zucchini! Thank you Gina. When making this, do you peel the zucchini before shredding it? Just came out of the oven and it is very Yummy! Gave it to my kids off the bus and they ate it up…I did add a few more choc chips than the recipe called for. Wanted to know if the cooking time is the same if you make as muffins?